In Michigan, industry and design intertwined creating an epicenter of modern design. Michigan’s visionaries touched nearly every aspect of American life. Detroit’s automobile manufacturers didn’t just produce automobiles; they styled them to become synonymous with the American dream. The state’s furniture manufacturers didn’t just manufacture furniture; they revolutionized the look of the American office and home. Michigan architects Albert Kahn, Eero Saarinen, and Minoru Yamasaki didn’t just design buildings; they defined an era. Michigan’s industry, prosperity, and educational institutions created a synergy that attracted the design talent that formed the foundation for modern American design. This exhibition celebrates Michigan’s outstanding contributions to Modern design and the stories of the people who made it happen. For more information about the Michigan Modern project, click here. Michigan Modern: Design that Shaped America is organized by the Michigan State Historic Preservation Office in association with Cranbrook Art Museum and curated by MPdL Studio. 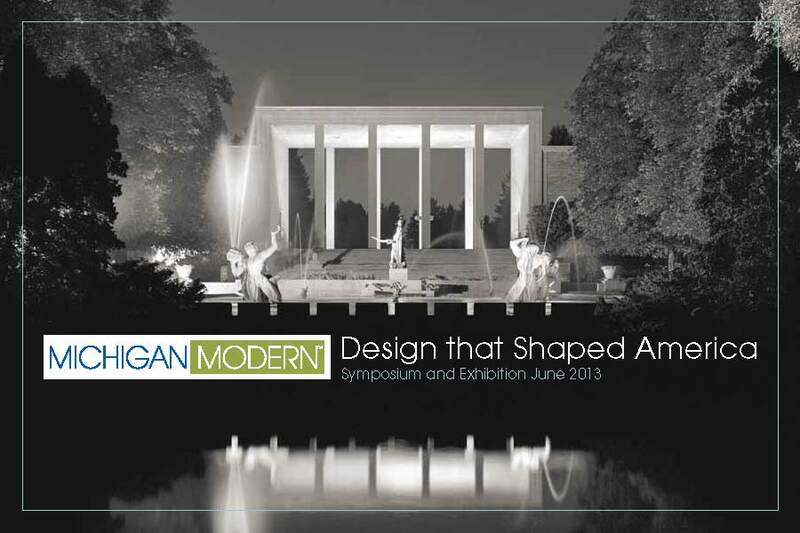 A symposium celebrating Michigan Modern will be held at Cranbrook, June 13-16, 2013. Michigan Modern: Design that Shaped America is supported by the State Historic Preservation Office, Michigan State Housing Development Authority, the Kresge Foundation, Cranbrook Art Museum and Cranbrook Center for Collections and Research, DeRoy Testamentary Foundation, Alden B. Dow Home and Studio, the McGregor Fund, Herman Miller, Eleanor & Edsel Ford House, Knoll, Robert W. Daverman, AIA, the Detroit Art Deco Society, the Michigan Historic Preservation Network, and the Michigan History Foundation.